Facebook Inc, introduced new tools in its network platform to enable user prevent any harassment in Facebook Messenger as part of the effort to build fair and safe community. The new tool was introduced due to feedback reported from users, organization representing and groups that excessively experience harassment. The new features is aim to prevent unwanted contact like friends request and messages from unknown user, and when someone that were blocked set-up a new account or tries to contact you by all means from another unknown account which cannot able to control by other user. 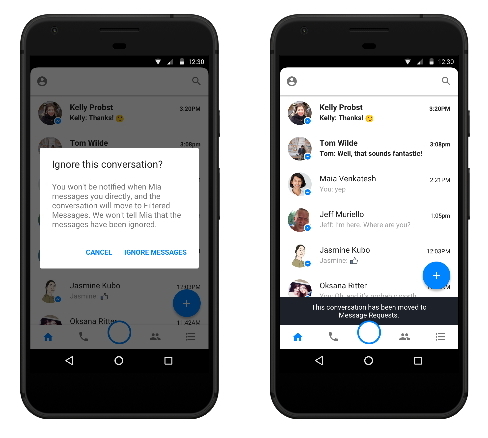 The new feature will provide an option for Facebook users to able them ignore any unwanted Messenger conversation and to automatically move it out of their inbox without blocking the senders. If you are daily observers that wherever one post a content that seem to be sexual, or pictures irritating, or bullying, and Facebook remove such content saying its goes against their community standard, or someone sending a friend request to unknown person and a pop-up saying “do you know the person, or does the person know personally, send friend request to person you know. All these are the Facebook concerns and people gives report on this bad experience. When reports are reviewed, immediate action are taking on such abuse, like removing such a content, disabling person’s accounts and limiting certain features like commenting for people who have violated their Community Standards. The social network want people to able to control what they share, who they share it with, and who can communicate with them. These new features for personal profile give people additional ways to manage their experience on Facebook network. In Preventing Unwanted Contact, people who have been blocked by someone still using different account to find their way through. In helping users prevent those bad encounters Facebook decided to use the existing features to wipe out and prevent unauthentic accounts on its network. According to Facebook, it was said that these automated features helps in real time to really identify those fake accounts more quickly and block millions of those accounts upon registration every day. While those new account created by someone who was previously blocked that causes harassment may not be caught sometime by these features. To actively recognize those types of accounts and preventing the owner sending a message or friend request to the person who blocked the original account, Facebook is then using various signals like an IP address to identify those fakes and harassers accounts. In Ignoring Messages, sometime if someone is being harassed, blocking sender prompt additional harassment. But Facebook is combat to eradicate all these harassment completely. To enable user ignoring messages, you can tap on a message to ignore the conversation. This will disables notification and moves the conversation from inbox to your Filtered Messages folder. User can read messages in the conversations without the sender know or seeing if the message has been read. This feature is now available for one on one conversation and will soon be available broadly for group messages too.